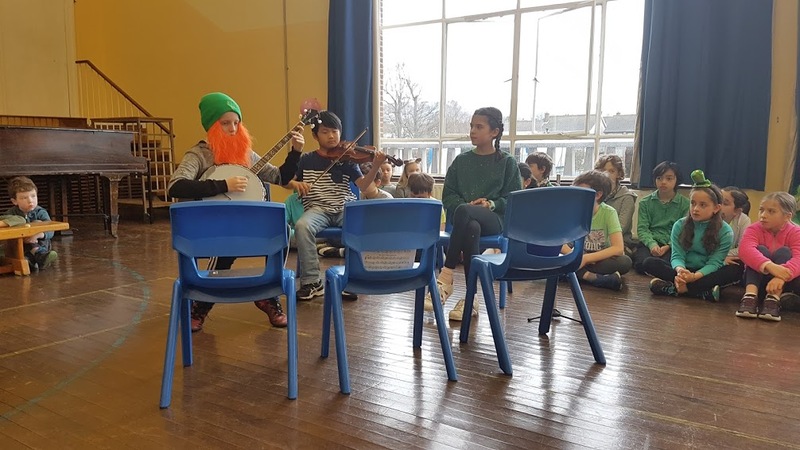 On Friday the 16th of March Ballinteer Educate Together school had a school Céilí Mór to celebrate Seachtain na Gaeilge and St. Patrick’s Day. The first acts from Fourth Class were three musicians, Carla who played the flute, Kian who played the Violin and Joseph who played the banjo. Then 4th Class sand two Irish songs called ‘Trasna na donnta’ and Óró mo bháidín. After that, 3rd and 4th danced the Siege of Ennis. Some girls from Laura’s class Second Class did some Irish Dancing which was very impressive!! After that, 3rd Class sang the cup song as Gaeilge! They had a great time watching all of the performances.